First, purchase this game at the app store for the price of $0.99. As nice games doesn’t come free. No sign up is required, just download and play. In this game, there are 4 boxes representing each difficulty of the game which also means there are 4 main seasons in the game. You start out with the Om Nom delivered to your front door in a Cardboard box. Once you earn at least 30 stars (You can earn 3 stars for each turn maximum and there are 25 levels to earn a max of 75 stars. Once you earn at least 30 stars you will unlock the second box which is the Fabric Box, 80 stars from the Fabric box will unlock the Foil box, and 190 stars will unlock the Gift Box. More boxes are expected to be added to the game soon so watch for updates. Cutting the String – You use your finger to cut across the string and you will need to figure out the best way to solve the puzzle earning the most stars possible. If you find a level too difficult you can catch as many stars as possible, feed the Om Nom and then come back to it later to try again. If you make a move that ensures you can’t win just cut the candy free and the game will immediately set up at the beginning for you again. As you progress in the game different obstacles will appear. You can also tap on the curved arrow at the top right of the screen to reset it if you reach a point you know you must start over again. 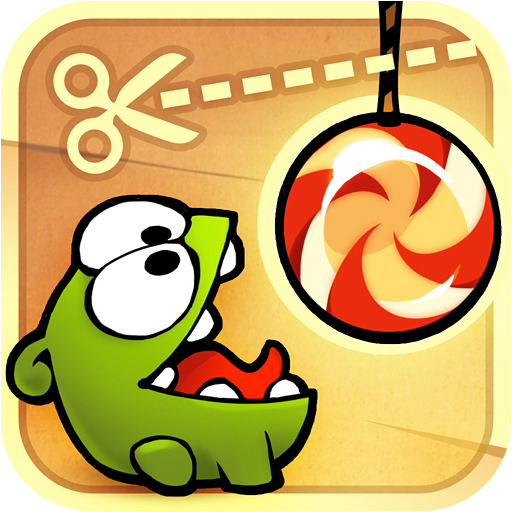 Candy – This is the round piece of candy attached to one or more ropes which you need to feed to the Om Nom. You will see at least one in each level. Bubbles – Candy that moves into bubbles will float upward. You can tap on them to pop the bubble which does not break the string. Stretched Ropes – Stretched Ropes are red in color. Blue dotted Circles – When a rope with candy hits the blue dotted circle it will turn into a rope which will hold your candy. Blue Dotted Circles with Slider Buttons – These have slider bars that will move the dotted blue circles to another location. Many times it is best to move these before you do anything else in a level. You will see some levels with one slider and some with several in a screen. Spikes – Candy should never touch spikes as it will shatter candy on contact. Some spikes are stationary in horizontal and vertical positions and some move up and down which means you will have to time out your moves to avoid them. Cutting Ropes – You can cut several ropes at the same time by slicing your finger across several at once. Multi Touch – This means you can use finger from both hands to cut through ropes on opposite sides at the same time. It’s tricky but once you get used to it you will find it very helpful. 1. Slide the top slide bar toward the right until it is positioned in the center as shown in image above. 2. Pull down the bottom slider just a tiny amount as shown in image above. 3. Slide your finger to Cut the Rope on the underside (Bottom) of Candy and it will fling up onto the dotted circle and another rope will be formed. 4. Slide the top slider to the right to allow the candy to hit the 3 Stars. 5. Once all stars are collected slide the top slider to the left until the Om Nom eats the candy. 1. Slide the slide bar down until the candy enters the balloon. 3. Immediately after you hit the air cushion slide the bar back up and guide it back to the top avoiding all the spikes. 4. Guide the candy into the Om Nom’s Mouth. Well this are the basic steps on conducting the game. Hope you guys enjoy playing this game and its very worth it to purchase this application. Happy cutting! Special thanks to Gamezebo for the info! This entry was posted on Saturday, February 19th, 2011 at 11:40 am	and is filed under iPhone games. You can follow any responses to this entry through the RSS 2.0 feed. You can leave a response, or trackback from your own site.